My first goal for June was to exercise at least ten minutes a day. My second goal was to do cardio at least 5 days a week, and to do yoga and strength training at least 3 days a week each. My third goal was to take a walk at a park at least three times. I did not reach any of these goals for June. I was feeling unmotivated during much of the month, and I exercised less during June than during any other month of 2018. In the past few days, though, I seem to have gotten my motivation back. So far for July I have already walked all three days, including once at a park, and I have done strength training three days, too. This morning I went outside and walked at 6:00 a.m.! I am going to continue with the same goals this month. I feel very optimistic about July. 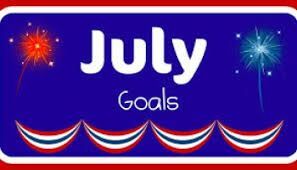 Best wishes for your July goals. YOU CAN DO IT!! We all have times where we don't feel very motivated. July is already off to a great start. Going for a walk early in the morning before it gets too hot might be the best thing to help keep you from being unmotivated. I feel certain July is going to be a good month for you! Great job! Glad you got a good start to July! Me too, June was rough. July will be better! 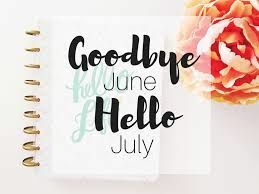 We can both put June behind us and move on to have a terrific July! You are starting out real well with your exercise! Glad July is starting out better for you. You're off to a great start. Yay, for you! Bring it on, July. Hope is up for the challenge. It's going to be a good month. You are off to a great start!!! Maybe getting your walk done early in the morning like that is going to keep you on track more, plus it's cooler. July is YOUR month!!!! !